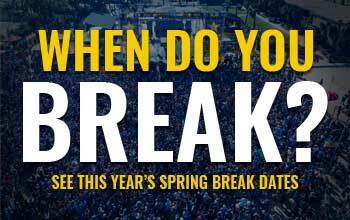 With bookings increasing for March, Panama City Beach looks set to retain the Spring Break crown once again. Having been the Spring Break capital of the World for years now, Panama City Beach is ready to celebrate another great year. The 27 mile stretch of Panama City Beach has a great selection of Hotels stay. There’s also Beach Houses, Condos and Resorts to chose from. Meaning you can split a room with up to 10 people, making it more fun and saving money! There are also lots of attractions, restaurants, bars and clubs to keep things fun all week long. It’s like having the perfect recipe. Everything just comes together in all the right proportions to make Panama City Beach THE Spring Break destination to experience. Over 300 days of sunshine per year. Almost 30 miles of stunning white sandy beaches. Warm, emerald-green Gulf Coast waters. Plus Beachfront Hotels that rent to Under 25’s. On top of that, you don’t need a passport for Panama City Beach! Since it’s within driving distance from so many surrounding states, you can just pack your flip-flops and bathing suit in your trunk and get in the car. Panama City Beach, Florida is driving distance from Louisiana, Mississippi, Alabama, Georgia, Arkansas, Tennessee and South Carolina. So you’ll get to make new friends from all over the country. The International Airport brings in students from all over the World! European Spring Breakers who want to experience the World famous Panama City Beach Spring Break for themselves arrive by the plane load! Panama City Beach is already known as a fun place to visit all-year round, not just during Spring Break. Dozens of special events take place throughout the year including music and food festivals. Motorcycle Rallies and Classic car shows use Panama City Beach as the setting for their events. Internationally known musicians and DJ’s including Lynyrd Skynyrd, Diplo, Steve Aoki, Luke Bryan and Keith Urban have even performed here. The Sandpiper Beacon Beach Resort is home to the World famous Tiki Bar. Located right on the beach, the Tiki Bar is a laid back tropical bar with fun contests and games all day. It’s a popular hang-out spot for Spring Breakers staying at other Hotels, because everybody is welcome. When the sun drops, the Tiki Bar transforms into one of the most popular clubs on the beach too. The Sandpiper Beacon is also one of the few places that rents to under 25 year olds for Spring Break. As well as Hotels rooms and suites they have Condos, Villas and Beach Houses too. Sleeping up to 10 people, these are a great way to split the cost and save money! Click here to learn more: www.springbreakfunplace.com.